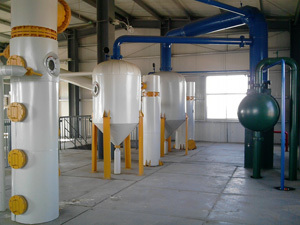 We are offering international quality standard Ginger Oil Extraction Machine for oil mills. High end technology and premium raw materials are used in manufacturing high performance and durable Ginger Oil Extraction Machine for solvent extraction plant. 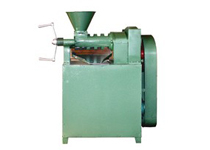 Understanding that ginger oil extraction machine is a delicate task, we design excellent range of seed oil extraction machine and Ginger Oil Refinery Machines as you required. First of all, ginger is cut into smaller pieces with the help of our ginger falking machine. Usually this cutting operation is carried out manually while our machines can do it automatically. After cutting of ginger, pieces are beat with the help of KMEC hammer machine to break the oil cells. These pieces of ginger are fed on a wire gauge, which is fixed in a mild steel kettle. After preparing the bed, the outlet of the kettle is connected to a water cooler and the outlet of the condenser is connected to the collecting pot. The steam at is passed into the kettle from the bottom. The steam passed through the pores of the ginger bed and extracts the volatile oil with it. 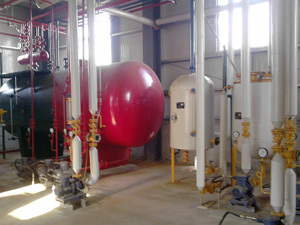 This extractor is carried out until hole of the volatile oil is extracted. The vapor of water and oil condenses in the condenser and falls into the collection pot. These pots are generally made of glass. In the pot, two layers are formed after the condensed vapors are settled. Water layer remains on lower side while oily layer floats on the water. Oil is separated from tin pot. Thus oil obtained by this method contains about 5 to 6% water. 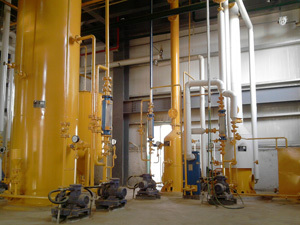 For separating the ginger oil, oil water mixture is subjected to reduce pressure distillation. 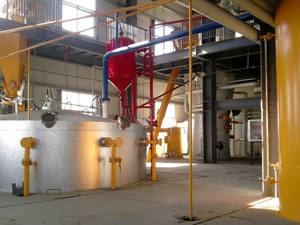 Crude ginger oil is taken in a flask like kettle and some arrangement are made as stated above for distillation process. A vacuum pump is connected in series in order to create vacuum. The flask is heated and pump is switched on when the required temperature is reached, the vapors of oil start coming out and these vapors are collected in a pot by condensing them in a condenser.Ginger oil is gethered in oil tank. Contact us today if you fond of in ginger oil extraction machines and service!